There's surely a global hit sitcom just waiting to be written about these screaming moral crazies. A face so vacant you could park a bus in it. I'd go for the entire bus station. Is he smiling from ear to ear because he's such a bellend? After a bloody good slapping first. I notice this trademark-look among prohibitionists: the big smile and those squinty-eyes...it's like a psychological protective mask they always wear, trying to hide behind the dishonesty and lies a shield they throw up to keep others from penetrating too deep. Scary. It's like the pod people. That or plain old concentration camp guards. I'd like to think it's a spoof but suspect otherwise. That said - I don't for a moment believe the USofA has any kind of monopoly on twerps like this. It's like a whole universe of smug in one face, isn't it? No spoof, it's from this video. 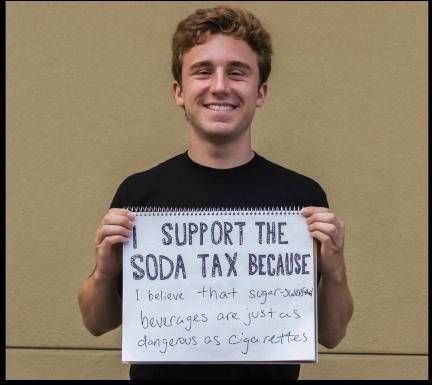 Yes, that is correct, San Francisco wants to be one of the first to tax and/or ban sugar drinks. They already banned plastic bags based on a concocted pseudo-science "study" (paper consumes more trees, fills more landfills, costs more to transport thus wasting fuel and increasing carbon footprint, but their politically motivated "study" determined to ban plastic was the way to go, thus "normalizing" it worldwide). This will "normalize" sugar tax though, once it passes, in a city known for having a 94% to 96% lock-step voting bloc approval on anything green, liberal, health fascist or progressive thrown at them to satisfy the UN agenda, for which SF Bay Area is locked into creating. Smoking is of course banned outdoors now in SF, including up to $500 fines for the "crime" of lighting up and being "unhealthy". It will be this with sugar drinks I imagine soon enough.